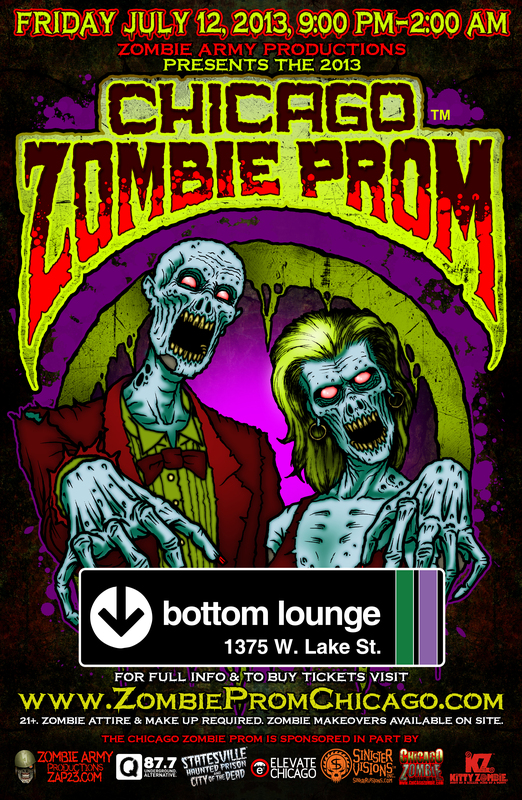 Zombie Army Productions will once again be hosting its annual Chicago Zombie Prom at Bottom Lounge (1375 W. Lake St., Chicago, IL 60607) on Friday, June 20th. As Chicago’s #1 Zombie Event, Zombie Prom is a ghastly, affectionate, cheesy blend of nostalgic high school Americana and the living dead. Zombie attire and makeup are required, but if you do not have your own makeup, zombie makeovers will be available for a $10 donation. Zombie Prom Chicago is for those 21 years of age and older and advance tickets start at just $30. This year’s Chicago Zombie Prom is pleased to welcome Wedding Banned as the live zombie band. Voted the best dance band in Chicago, by Chicago Rocker magazine, these guys are sure to keep you moving all night. Other Chicago Zombie Prom highlights include the annual Zombie Prom King & Queen contest, a photo booth and a free buffet (open from 9:00-10:30pm). Throughout the night there will be prizes and giveaways from Zombie Prom Chicago’s sponsors, which currently include Zombie Army Productions, Riot Fest, Elevate Chicago, Q101.1 and ChicagoZombie.com. For additional information on Chicago Zombie Prom, go to www.ZombiePromChicago.com or contact John LaFlamboy at 708-651-2323 / brains@zombiearmyproductions.com.